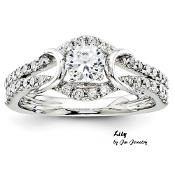 "Lily" is boasting with thirty six (36) Genuine Round Brilliant Cut diamonds in the band totaling 1/2ctw. The center is a 1/2ct Genuine Round Brilliant cut diamond. All diamonds are SI in clarity and G-H-I in color.